After joining the blogging world I have found a new love for all things beauty and have to refrain myself from splurging in various beauty stores. I went to Boots recently to actually find a Soap and Glory face cleanser which they ended up not having, but somehow I still managed to spend £29 pounds. I’ve never used lashes. Yep, I’m a complete fake eye lashes virgin. 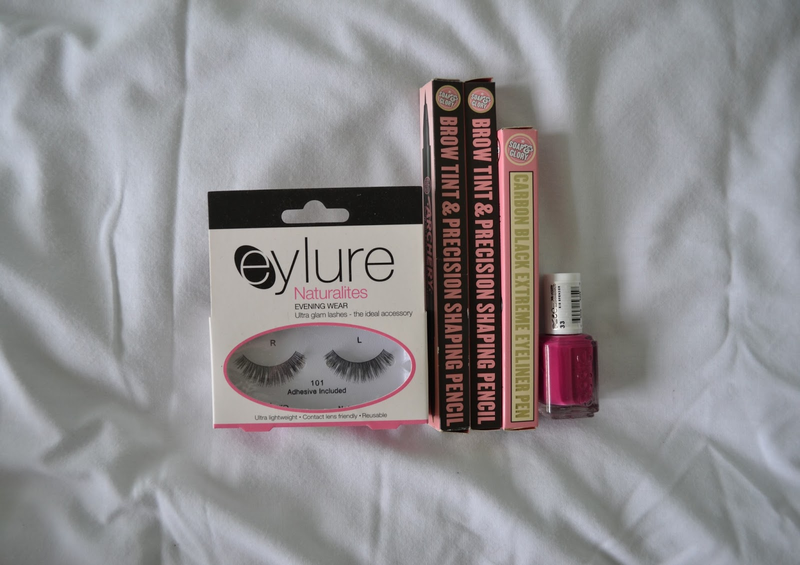 I decided this needed to change so I purchased these after being told Eyelure were a good brand. I may have got some too bigger ones but I’m just going to be practising with these!! I know there is a massive hype over Soap and Glory products but never realised they did Make-Up. I decided to try out the eyeliner and the Brow pencil as I’m fed up of using cheap ones that quite frankly look awful! Finally, I am addicted to nail polish, it’s very rare that I ever leave the house without some colour on my nails. There has been many good words about Essie so I decided to give this one a go, in the shade ‘Big Spender’. I am pleasantly surprised. Definitely going to be reviewing these products sometime soon!